ORMOC CITY, Leyte – A member of the Civilian Armed Forces Geographical Unit (Cafgu) Active Auxiliary was arrested after he allegedly shot and wounded a soldier in a dance brawl in Calbiga, Samar on Wednesday. Senior Insp. 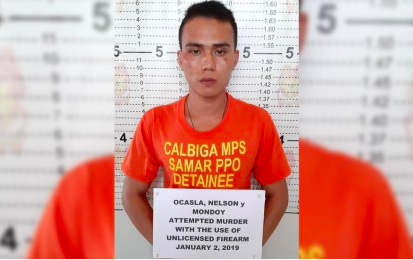 Michael Ray Cañete, Calbiga town police chief, identified the arrested suspect as Nelson Ocasla, 24, who is assigned at the 4th Western Samar Cafgu Active Auxilliary unit in Botoc village, Pinabacdao, Samar and a resident of Can-avid, Eastern Samar. Cañete, in a phone interview, said the victim, Private 1st Class Anthon Balledo, 23, sustained a gunshot wound at the back of his head. Balledo was taken to the Eastern Visayas Regional Medical Center and has been declared out of danger. Balledo, who was on a break as an active member of the 63rd Infantry Battalion under the 8th Infantry Division of the Philippine Army and stationed in San Jorge, Samar, is a resident of the same place where the incident happened. Citing accounts of witnesses, Cañete said prior to the incident, Ocasla was at the dance area, already drunk and indiscriminately pointing his gun. Balledo, who was also at the party, observed the rowdy behavior of the militiaman. He tried to stop him, but instead he was shot and was slightly hit at the back of his head. Ocasla immediately escaped on board a motorcycle. Policemen later arrested Ocasla inside his detachment near the party venue. Taken from his possession was a .45-caliber pistol with markings “Government Model Colt Automatic Caliber .45”, bearing serial number 663468, and a magazine loaded with seven live ammunition.